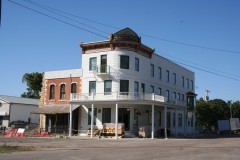 Built in 1903, the Waterville Opera House is located across the street from the Missouri Pacific Railroad tracks and the National Register-listed Weaver Hotel. 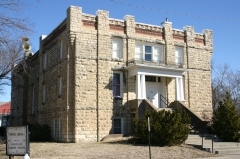 Designed by Frankfort, Kansas architect A. W. Snodgrass, this two-story limestone building was constructed by area craftsmen with locally quarried limestone and has remained in the ownership of the city since its construction. The bottom floor was built to house the city's government offices, library, banquet room, kitchen, restrooms, and dressing rooms. An auditorium and raised stage has always occupied the second floor space. The property is nominated for its association with local entertainment and government history, and for its significance as a unique architect-designed opera house and city hall with Classical Revival detailing.